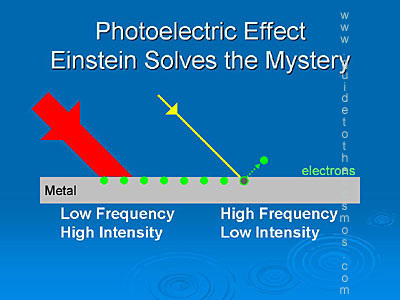 The photoelectric effect is when photons hit a metal passing its energy into the delocalised electrons removing them from the electrostatic forces holding them in the metal. As a photon is a quantum packet of energy as it passes its energy on it no longer exists. Only high frequencies carry enough energy to overcome the work function of the metal - this is called the threshold frequency. However the intensity of the light makes no difference as only one photon can hit an electron so the energy of each electron doesn't change just the amount of electrons being released increases. A gold leaf electrosope is used to show the photoelectric effect. When a negative charge is put through the apparatus then the gold leaf is repelled from the metal bar as they have the same charge. To get rid of this negative charge UV light can be shone on the metal cap and this removes the excess electrons. By removing the charge the gold leaf is no longer repelled so returns to the side of the metal bar. 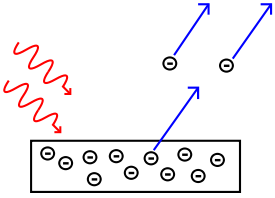 The energy of a photon can be worked out by multiplying the frequency by the Planck's Constant which was created by one of the pioneers in Quantum Physics. 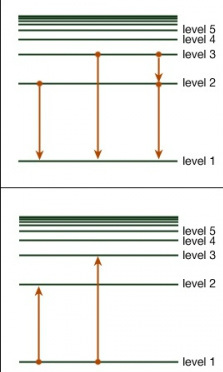 These are discrete levels where an electron can sit. In an exam they'd give you the levels with corresponding energy values. These mean how much energy is required to remove the electron from the atom from that energy level. Ground level always has the lowest highest value.